Add rich, British-flavored tube tone with great modern features to your rig. 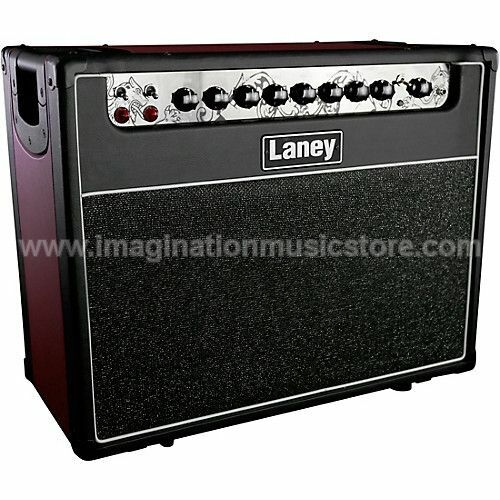 GHR is the product of Laney’s long-term study of how guitar players interact with tube amps. “Tube tone” is composed with what we have come to describe as “RED” and “BLACK” tone elements: RED is tube preamp distortion, in which ECC83 tubes add drive. BLACK is output tube distortion which increases as the power tubes are driven harder. GHR allows the player to balance RED and BLACK elements to seek the sweet spot in each player’s setup. The result of intensive design and development in Great Britain, the GH30R-112 delivers 30 watts RMS of pure, EL34 tube power into a 1x12″ Celestion V-Type driver. Both of the GH30R-112’s channels can be configured to be used either clean or driven, with each channel producing subtle differences in tone depending on how you tweak them. This is the "amp tweaker’s" delight! Whether its funk or melodic rock, whether you’re a hybrid picker or a shredder, the GH30R delivers outstanding, dynamic, complex, rich & colorful guitar tones. The GH30R’s unique Master Output control allows you to dial in just the right balance of pre-amp v’s power-amp distortion to find the sweet spot. A Master Tone control also allows tonal adjustment at the end of signal chain. The 3-band tone stack is shared between channels giving a simple yet effective tone palette. A Pull Shift function also increases the tonal flexibility of the mid-range. Studio-quality digital reverb gives rich ambience to the sound via a rotary control. A Pull Focus function adds further variation according to preference.